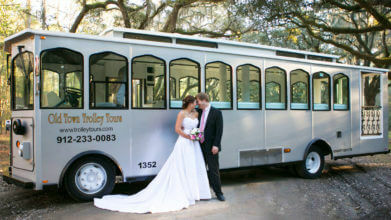 Old Town Trolley Tours of Savannah is pleased to provide shuttle service to any hotel, Bed & Breakfast, and Inn within the Historic District (Downtown Savannah) to our Car Barn Depot where guests can purchase tickets and proceed to the Visitors Center at Stop #1. Shuttle Service for the Historic District is from 9:00am to 4:15pm, seven days a week. Return service is provided when you are finished with your tour. Please call (912) 233-0083 to arrange your shuttle pick up. 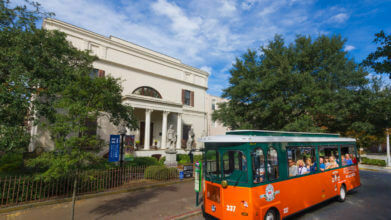 Old Town Trolley Tours of Savannah is pleased to provide shuttle service to our guests staying outside of the Historic District. There is one shuttle pick up provided at 9:00am with a 30 minute window to our Car Barn Depot where guests can purchase tickets and proceed to the Visitors Center at Stop #1. Return service promptly leaves at 4:30pm from our Carbarn Depot at 234 Martin Luther King Jr. Blvd. You MUST call to secure shuttle pickup prior to pickup time. Please call (912) 233-0083 for shuttle reservations.